After our tulip adventure in the Skagit Valley, we drove over to the nearby town of Anacortes to try the best clam chowder in the Valley. 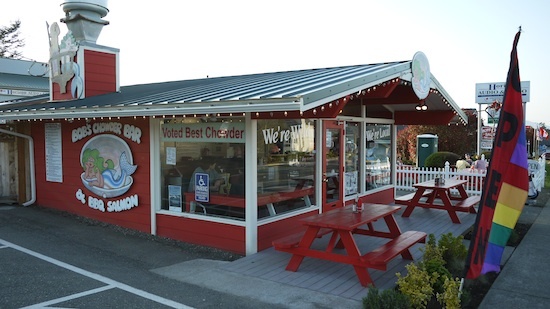 Bob’s Chowder Bar & BBQ Salmon is a small roadside restaurant nestled at the end of the town’s main commercial avenue. The restaurant has a very interesting history. It’s about the love. That’s the Bob philosophy. It’s about the love of food, the love of friends and the love of Babs and Bob. Bob’s started because Babs used to sell jam at the farmer’s market. Bob was gone to sea for seven months of the year and Babs had to keep busy, so she jammed. Bob was lonely on Saturdays, so he grabbed a grill and a big soup pot and started making chowder and grilled salmon for visitors to eat while shopping at the farmers market. Soon enough, Bob was outselling Babs, so Babs quit jamming and joined Bob. Bob decided to not go to sea anymore. He took all of his years as an Executive Chef and Chief Steward and put them to work. Now Babs and Bob have Bob’s. Bob’s reminds me of Wally’s Burger. They both offer great food at great prices. Most of the seats (red picnic tables) are outside the restaurant. There’s really no tables inside. Just a few chairs, and a long red broad that run the length of the restaurant, to place your food. I would say no more than ten people can dine inside at any one time. Bob’s New England style clam chowder cost only $3.95 a bowl and is the most popular item on the menu. One taste and you’ll understand why. The chowder was simply delicious, but I thought it could have been a bit hotter temperature wise. 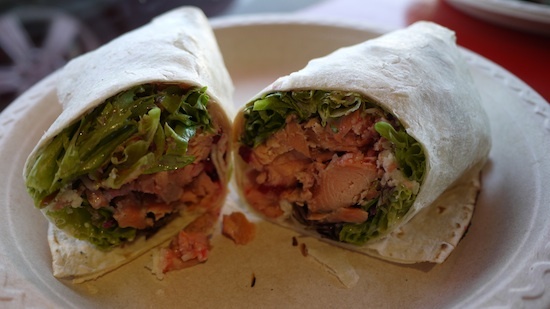 The other signature item is the grilled wild salmon. 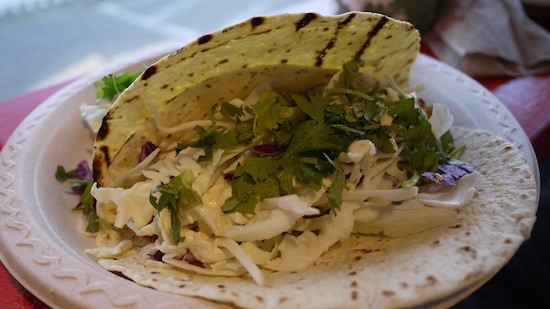 You think it would come in a plate but it a unique twist, it’s wrapped in a fresh tortilla. I also had a chance to sample the fish taco. It was good but not as good as the fish taco from the South Shore Grill in Waikiki. Overall, I’m very happy I made the trip to Bob’s Chowder Bar & BBQ Salmon. 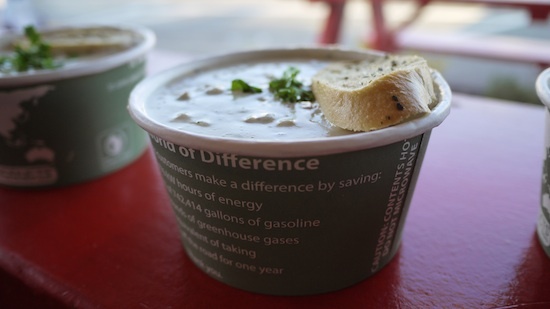 They server some the best chowder in the west coast and offer great value for the money. I would definitely go there again if I’m in Anacortes. Bob’s Chowder Bar capped a great ending to an awesome tulip adventure.